Liverpool by the Schuylkill? Manchester in Chichester? 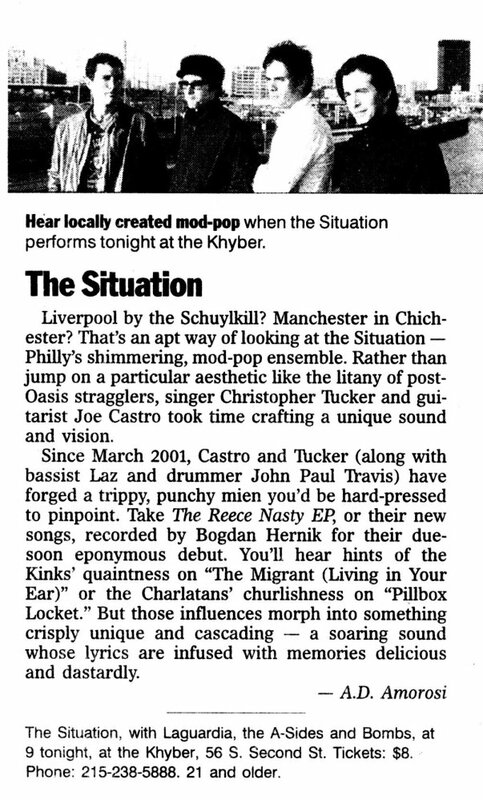 That's an apt way of looking at the Situation - Philly's shimmering, mod-pop ensemble. Rather than jump on a particular aesthetic like the litany of post-Oasis stragglers, singer Christopher Tucker and guitarist Joe Castro took time crafting a unique sound and vision. Since March 2001, Castro and Tucker (along with bassist Laz and drummer John Paul Travis) have forged a trippy, punchy mien you'd be hard-pressed to pinpoint. Take The Reece Nasty EP, or their new songs, recorded by Bogdan Hernik for their due-soon eponymous debut. You'll hear hints of the Kinks' quaintness on "The Migrant (Living in Your Ear)" or the Charlatans' churlishness on "Pillbox Locket." But those influences morph into something crisply unique and cascading - a soaring sound whose lyrics are infused with memories delicious and dastardly.